The thing which the entire country has been waiting for ever since Sochi was announced as the host of the 2014 Winter Olympics seven years ago has finally happened. Many of the volunteers had a chance to see the ceremony with their own eyes before the rest of the planet; tickets for the general rehearsals were awarded to them as an incentive. Nevertheless, most of us weren't so lucky. On the day of the ceremony a rumour started going around that some of the volunteers would be allowed to attend the actual event at the Fisht Stadium in order to fill any unsold seats. Rumours always spread at light speed at large gatherings, so everyone who wasn't scheduled to be on duty in the afternoon signed up for those unsold seats via their team leaders and arrived at the Olympic Park to await their fate. Eventually, a huge crowd of them gathered, everyone waiting eagerly for the news. The atmosphere was upbeat and cheerful at first, but gradually people began to despair. Of course, most of us didn't get a free seat after all; only a few lucky colleagues who were the first to arrive and sign up actually ended up at the stadium during the ceremony. They were left hugely impressed by what they saw. One of them, a friend of mine, completely lost his ability to communicate in coherent sentences after the ceremony, and responded to my texts asking him how it went with rows of smileys and exclamation marks. As for myself, when I finally realized a few minutes before the start of the ceremony that I would not land a free ticket after all, it turned out that the nearest available TV screen was a 20-minute jog away. So for me the Olympics kicked off in a fittingly athletic fashion: I ran as fast as I could so as not to miss the beginning. For many foreigners, deciphering the messages and meanings of the ceremony’s various episodes was not an easy task. I heard many of them trying to puzzle it out who Uncle Styopawas, or why the Russian Troika (a traditional Russian sleddriving combination, using three horses abreast) is such an important national symbol. I’ve heard very different explanations – some of them utterly hilarious. For example, I overheard one Brit trying to persuade another that Uncle Styopa, the kindly protagonist of Russian children’s stories, was actually a symbol of the police state and Putin’s Russia in general. 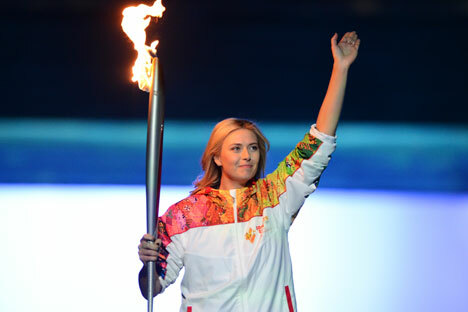 Of course, the lighting of the Olympic flame and the fireworks are a key part of any Olympic ceremony. As soon as the flame was lit, a stampede of journalists and media center staff who watched the event on TV screens in the lobby rushed past me to get outside. Everyone was keen to see the stunning fireworks display over the Olympic Park with their own eyes. They came back panting and short of breath, but with a huge grin on their faces; it seems the fireworks looked even more impressive live than they did on TV. As we were returning from the ceremony, an American guy sitting next to me on the bus was typing frantically away on his mobile phone, mumbling the text of his message out loud. “Even though I have seen many strange things that cannot be understood or explained, we must try to understand and accept them,” he wrote. “After all, the Russians have done a great job and did their best to let us understand their mysterious soul at least a little bit."